You are at:Home»Knowledge»Computational Tinkering Three Ways — Wonderful Idea Co. Wonderful Idea Co. has been hosting computational tinkering workshops where learners use recycled materials to build arduino powered dancing robots. 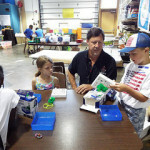 Read about these workshops at: Computational Tinkering Three Ways — Wonderful Idea Co.